An earthquake with a magnitude of 5.1 on the Richter scale hit the Greenland Sea on April 26, 2014, at 03:55:33 UTC at a depth of 10.00 km (6.21 mi). The epicenter of the earthquake is located right on the faultline that crosses the Arctic Ocean, at 73.479°N 7.974°E, some 567km (352mi) SSW of Longyearbyen, Svalbard. This follows four further recent earthquakes close to Svalbard or on the faultline north of Greenland, as indicated on above map. All these earthquakes struck at a depth of 10.00 km (6.21 mi). 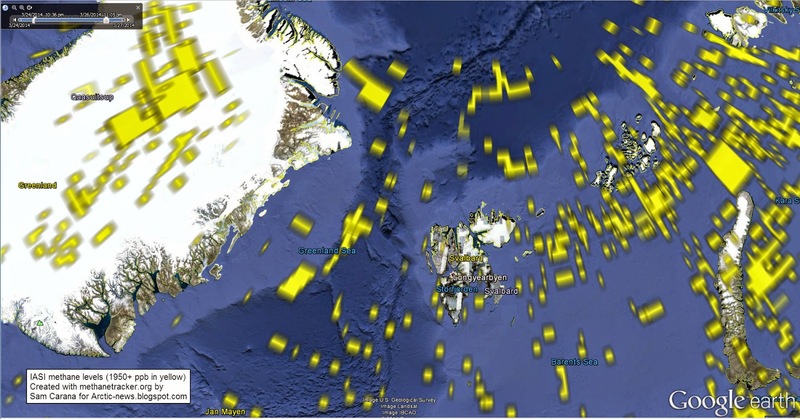 There have been a large number of earthquakes around Greenland since early 2014, as illustrated by the image below. This could be an indication of isostatic rebound, as also discussed in this earlier post. 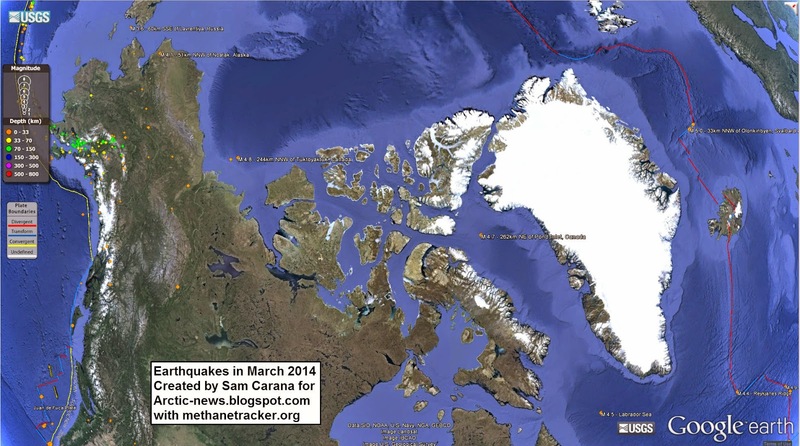 An earthquake with a magnitude of 4.4 on the Richter scale hit the Arctic Ocean north of Greenland on April 22, 2014, at 10:30:23 UTC at a depth of 10.00 km (6.2 mi). The epicenter of the quake is located right on the faultline that crosses the Arctic Ocean, at 83.328°N 4.568°W, 262km (163mi) NE of Nord, Greenland. 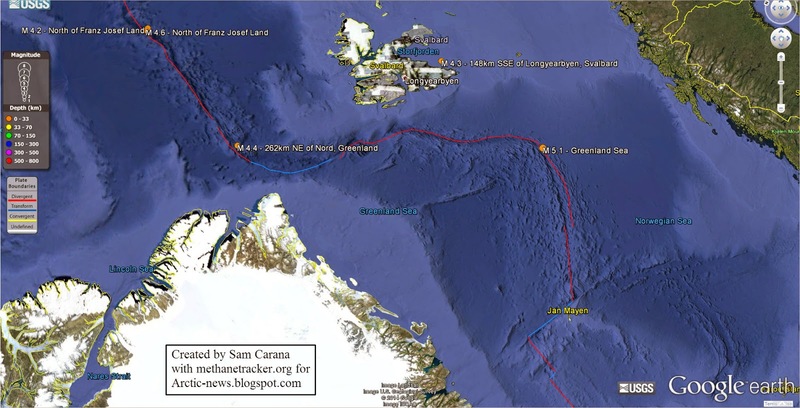 The earthquake follows another earthquake that hit the Arctic Ocean closeby on this faultline, on April 13, 2014, north of Franz Josef Land. Earthquakes at this location are very worrying, as they can destabilize hydrates contained in the sediment under the seafloor of the Arctic Ocean. Furthermore, one earthquake can trigger further earthquakes, especially at locations closeby on the same faultline. 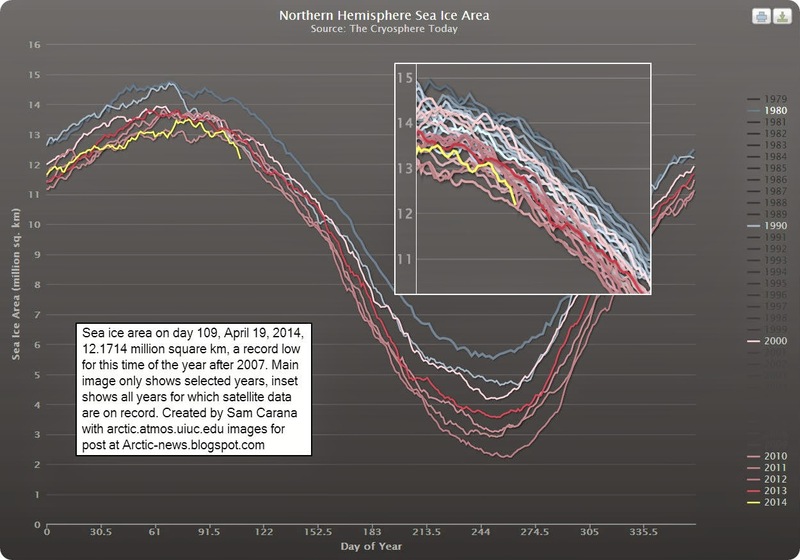 Arctic sea ice area is in steep descent, as illustrated by the image below. Sea ice area was only smaller at this time of the year in 2007, for all years for which satellite data are available. Earlier this year, on March 9, 2014, Arctic sea ice area was at a record low for the time of the year. Since then, area did show some growth for a while, to the north of Scandinavia. This growth could be attributed largely to strong winds that made the sea ice spread with little or no growth in volume. The 30-day Naval Research Laboratory animation below shows recent sea ice speed and drift. 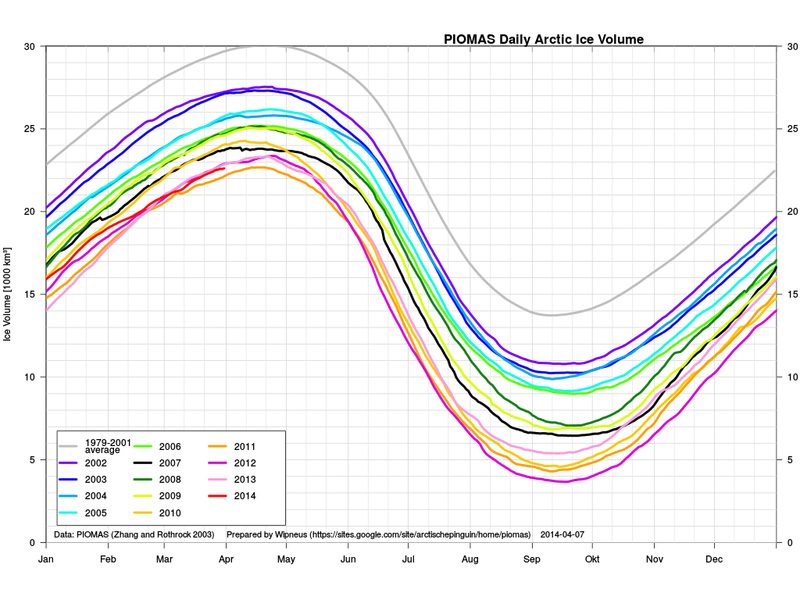 Indeed, sea ice volume in March 2014 was the 2nd lowest on record. Only March 2011 had a lower volume as discussed in a recent post. The 30-day Naval Research Laboratory animation below shows recent sea ice thickness. Low sea ice volume and area jointly suggest there could be a total collapse of the sea ice later this year, in line with observation-based non-linear trends. For years, this blog has warned that observation-based projections point at Arctic sea ice disappearance within years, with dire consequences for the Arctic and for the world at large. ". . apart from melting, strong winds can also influence sea ice extent, as happened in 2007 when much ice was driven across the Arctic Ocean by southerly winds. The fact that this occurred can only lead us to conclude that this could happen again. Natural variability offers no reason to rule out such a collapse, since natural variability works both ways, it could bring about such a collapse either earlier or later than models indicate. In fact, the thinner the sea ice gets, the more likely an early collapse is to occur. It is accepted science that global warming will increase the intensity of extreme weather events, so more heavy winds and more intense storms can be expected to increasingly break up the remaining ice, both mechanically and by enhancing ocean heat transfer to the under-ice surface." 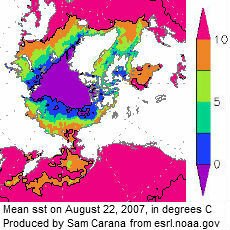 The image on the right, produced with NOAA data, shows mean coastal sea surface temperatures of over 10°C (50°F) in some areas in the Arctic on August 22, 2007. In shallow waters, heat can more easily reach the bottom of the sea. In 2007, strong polynya activity caused more summertime open water in the Laptev Sea, in turn causing more vertical mixing of the water column during storms in late 2007, found a 2011 study, and bottom water temperatures on the mid-shelf increased by more than 3°C (5.4°F) compared to the long-term mean. Another study found that drastic sea ice shrinkage causes increase in storm activities and deepening of the wind-wave-mixing layer down to depth ~50 m (164 ft) that enhance methane release from the water column to the atmosphere. Indeed, the danger is that heat will warm up sediments under the sea, containing methane in hydrates and as free gas, causing large amounts of this methane to escape rather abruptly into the atmosphere. Such warming would come on top of ever-warmer water that is carried by the Gulf Stream into the Arctic Ocean and that has already been blamed for large methane releases from the seafloor of the Arctic Ocean last year. The prospect of an El Niño event, as discussed in an earlier post, makes the situation even more dire. The consequences of sea ice collapse will be devastating, as all the heat that previously went into transforming ice into water will be asbsorbed by even darker water, from where less sunlight will be reflected back into space. The danger is that further warming of the Arctic Ocean will trigger massive methane releases that could lead to extinction at massive sclae, including extinction of humans. Hopefully, more people will realize the urgency of the situation and support calls for comprehensive and effective action as discussed at the Climate Plan blog. Is there a mechanism that could make humanity go extinct in the not-too-distant future, i.e. within a handful of decades? Most people will be aware that emissions due to human activity are causing global warming, as illustrated by the arrow marked 1 in the image on the left. Global warming can cause changes to the land, to vegetation and to the weather. This can result in wildfires that can in turn cause emissions, thus closing the loop and forming a self-reinforcing cycle that progressively makes things worse. Furthermore, less forests and soil carbon also constitute a decrease in carbon sinks, resulting in carbon that would otherwise have been absorbed by such sinks to instead remain in the atmosphere, thus causing more global warming, as illustrated by the additional downward arrow in the image on the right. In conclusion, there are a number of processes at work that can all reinforce the impact of global warming. 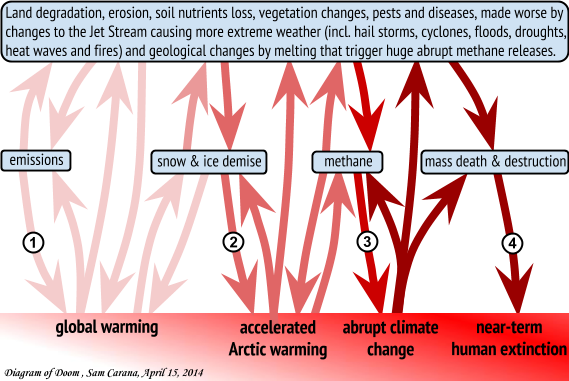 Emissions can also contribute more directly to land degradation, to changes in vegetation and to more extreme weather, as indicated by the additional arrow pointing upward in the image on the right. A recent study by Yuan Wang et al. found that aerosols formed by human activities from fast-growing Asian economies can cause more extreme weather, making storms along the Pacific storm track deeper, stronger, and more intense, while increasing precipitation and poleward heat transport. Similar developments appear to be taking place over the North Atlantic. Huge pollution clouds from North America are moving over the North Atlantic as the Earth spins. In addition, the Gulf Stream carries ever warmer water into the Arctic Ocean. As the image below shows, sea surface temperature anomalies at the highest end of the scale (8 degrees Celsius) are visible off the coast of North America, streching out all the way into the Arctic Ocean. As said, feedbacks as are making the situation progressively worse. Feedback loops are causing warming in the Arctic to accelerate. Warming in the Arctic is accelerating with the demise of the snow and ice cover in the Arctic, and this is only feedback #1 out out many feedbacks that are hitting the Arctic, as described in an earlier post. As the temperature difference between the equator and the Arctic decreases, the Jet Stream is changing, making it easier for cold air to move out of the Arctic and for warm air from lower latitudes to move in (feedback #10). 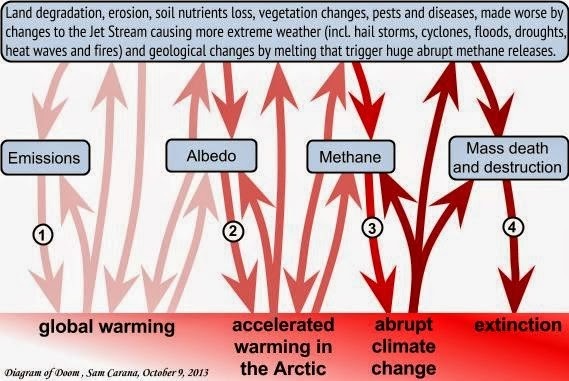 The danger is that, as temperatures over the Arctic Ocean warm up further and as the Gulf Stream carries ever warmer water into the Arctic Ocean, large quantitities of methane will erupt abruptly from the seafloor of the Arctic Ocean, adding a third kind of warming, runaway warming resulting in abrupt climate change, and leading to mass death, destruction and extiction of species including humans. Persistence of such a progression makes it inevitable that the rest of Earth will follow the huge temperature rises in the Arctic. Massive wildfires will first ignite across higher latitudes, adding further greenhouse gas emissions and causing large deposits of soot on the remaining snow and ice on Earth, with a huge veil of methane eventually spreading around the globe. The poster below, from an earlier post, illustrates the danger. How likely is it that the above mechanism will cause human extinction within the next few decades? What views do the various contributors to the Arctic-news blog have on this? Guy McPherson has long argued that, given the strengths of the combined feedbacks and given the lack of political will to take action, near-term human extinction is virtually inevitable. In the video below, Paul Beckwith responds to the question: Can climate change cause human extinction? Further contributors are invited to have their views added to this post as well. While many contributors may largely share Paul Beckwith's comments, it's important to highlight that contributors each have their own views, and this extends to their preference for a specific plan of action. One of the more controversial issues is the use of geo-engineering. Guy McPherson doesn't believe geo-engineering will be successful. In the video below, Paul Beckwith gives his (more positive) views on this. 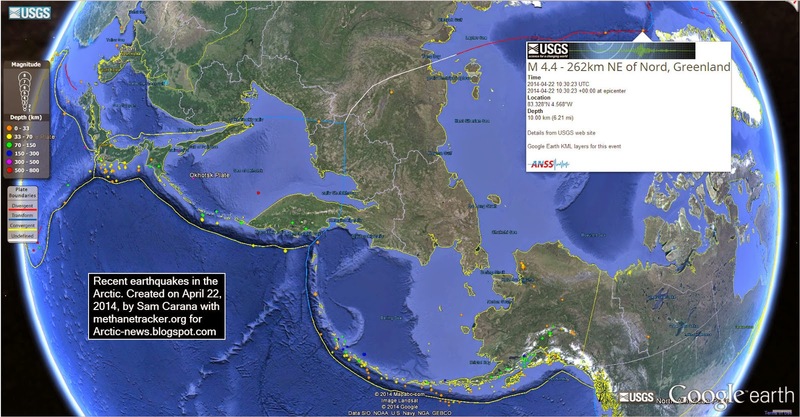 An earthquake with a magnitude of 4.5 on the Richter scale hit the Arctic Ocean on April 13, 2014, at 02:12:19 UTC at a depth of 10.00 km (6.21 mi). 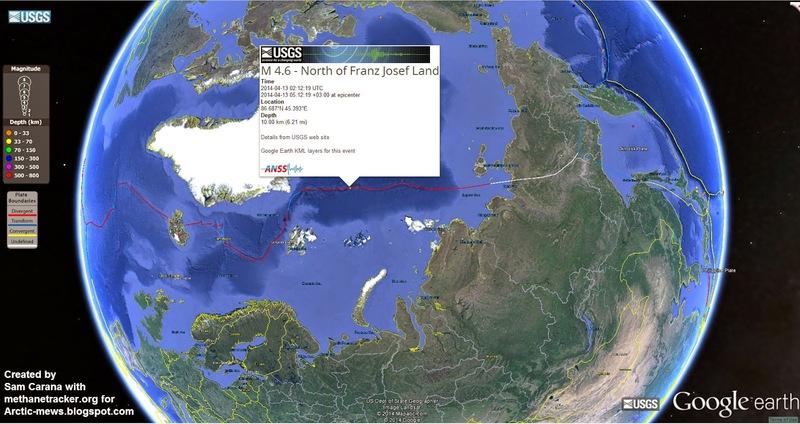 The epicenter of the quake is located right on the faultline that crosses the Arctic Ocean, at 86.687°N 45.393°E, some 800 km north of Franz Josef Land. Levels of carbon dioxide (CO2) in the atmosphere are now firmly above the 400 parts per million (ppm) level, as illustrated by the graph below, from keelingcurve.ucsd.edu. 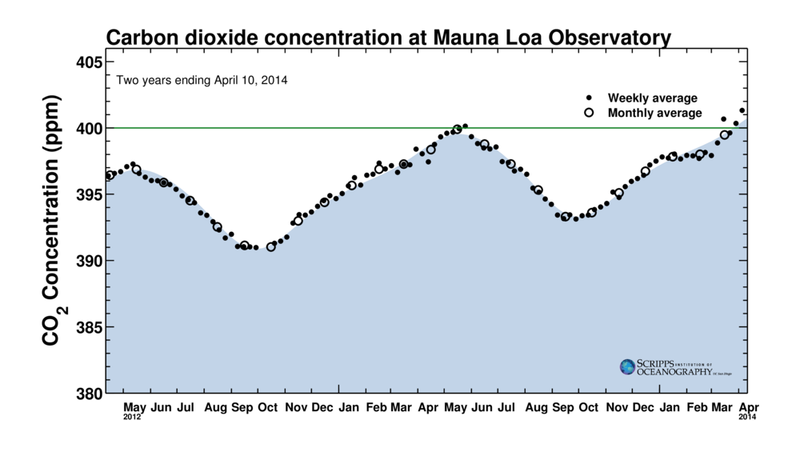 As above graph shows, levels of CO2 go up and down with the seasons. Even higher levels are expected to be reached in May 2014. Importantly, 400 ppm is 143% its pre-industrial peak levels of 280 ppm. 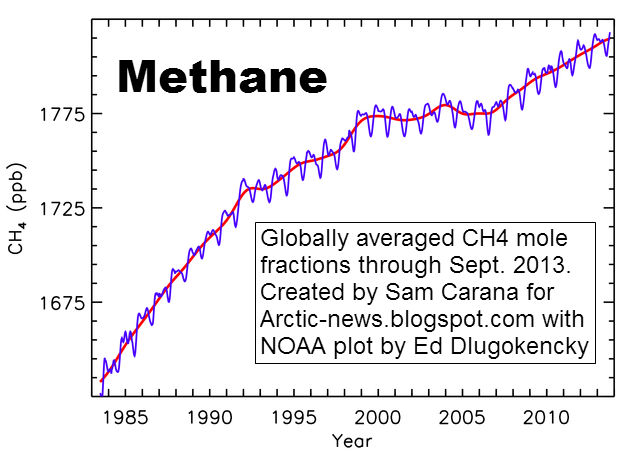 Levels of methane (CH4) in the atmosphere are rising even faster. 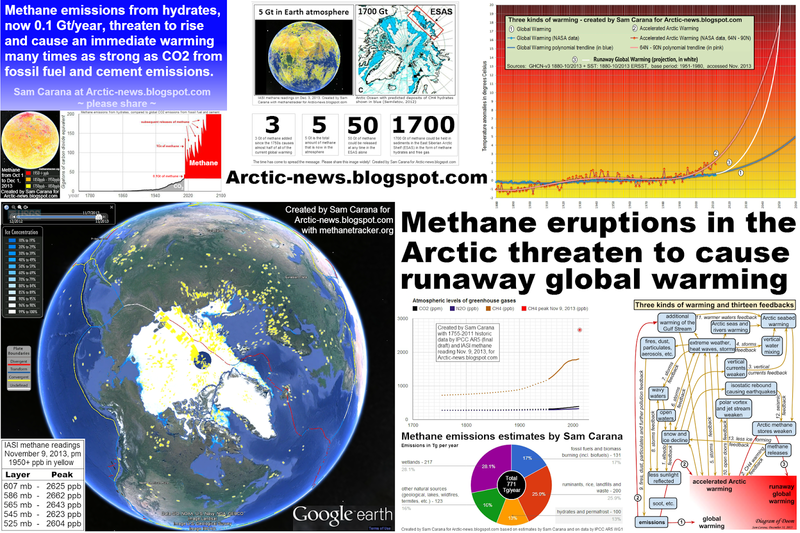 According to IPCC AR5, methane levels were 1798 ppb in 2010 and 1803 ppb for 2011. A graph included in an earlier post shows historic levels of CH4, CO2 and N2O levels, highlighting methane's steep rise (now some 250% its pre-industrial level). The graph below, based on a plot by NOAA, shows the rise of methane over the past few decades and also shows that methane levels similarly go up and down with the seasons. Globally, IPCC/NOAA figures suggest that abundance of methane in the atmosphere did reach 1814 ppb in 2013 and is rising with some 5 to 6 ppb annually. IASI data show that - at the hight of the northern summer, in August 2013 - mean methane levels rose strongly, to levels well above 1800 ppb, as also discussed in posts such as this one. Next to seasonal variations, methane levels also differ depending on altitude. Often, when mean methane values are given, readings at 14,383 feet altitude are used, as methane typically reaches its highest levels at this altitude. The image on the right compares methane levels for 2013 and 2014 at this altitude over six recent days, with a.m readings and p.m. readings for each day. Around this time of year in 2013, as the graph shows, methane levels went through the 1800 ppb mark. The same thing occurred this year, while levels have meanwhile increased with a few ppb, so at first glance methane's rise appears to continue as anticipated by the IPCC. While the above is very worrying, the situation may be even more dire than this. 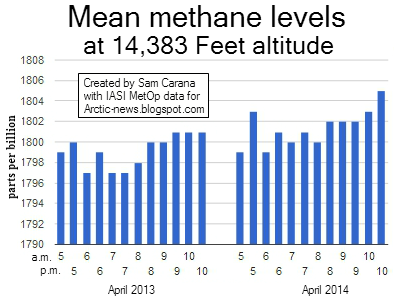 The graph below compares methane levels in 2013 and in 2014, averaged over the same six-day period (April 5 through to April 10) and at six different altitudes. Above image indicates that, while the difference between 2013 and 2014 at lower altitudes (8,367 feet and 14,383 feet) may seem relatively small, increases at higher altitudes may be much stronger. In other words, rather than rising in a similar way across all altitudes, methane may in fact be building up much more strongly at higher altitudes. This frightening possibility was raised a few times at this blog, such as in the altitude analysis in January 2014 and in the post Quantifying Arctic Methane, which noted that IPCC-estimates of global methane levels may rely too much on low-altitude data collected over the past few decades. Indeed, the total methane burden may already be rising much more rapidly than the IPCC is anticipating, also because methane is rising in the atmosphere, increasing the burden especially at higher altitudes, as evidenced by increasing occurence of noctilucent clouds. The above analysis uses a limited dataset, just like the previous one, but if verified by further analysis, it could be that a dramatic rise in the presence of methane in the atmosphere is occuring without showing up at lower altitudes. This could also explain how earlier releases of methane from hydrates could have been ignored by many, i.e. relatively small increases in methane levels at relatively low altitudes may have given a false reassurance that such releases were not adding much methane to the atmosphere. Further analysis, comparing satellite data at different altitudes over the years, could give more clarity on these points. 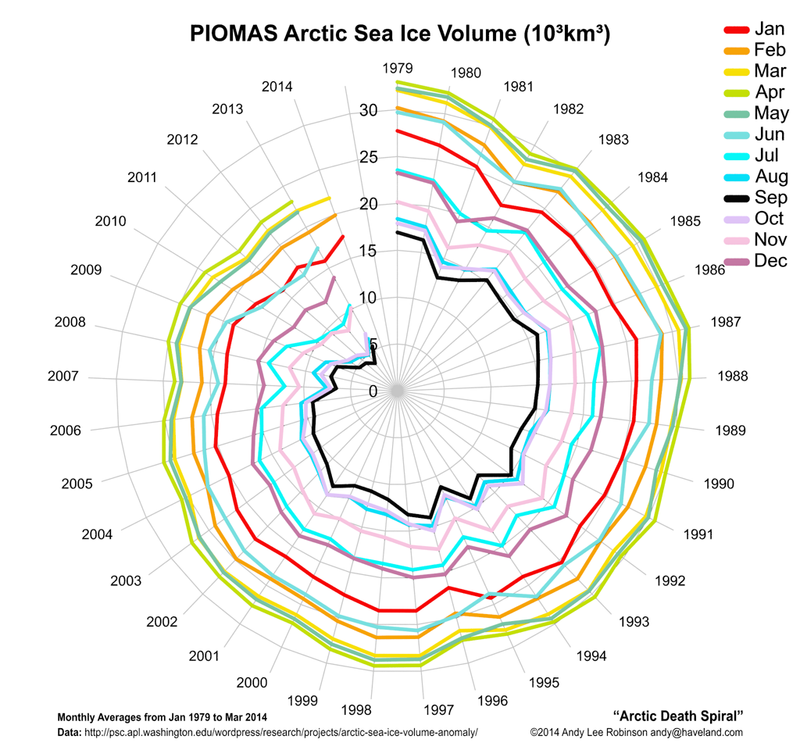 The March 2014 Arctic sea ice volume, as calculated by the Pan-Arctic Ice Ocean Modeling and Assimilation System (PIOMAS) at the Polar Science Center, was the 2nd lowest on record at 21.818 km³. Only March 2011 had a lower volume, at 21.421 km³, as illustrated by the graph below, by Wipneus. 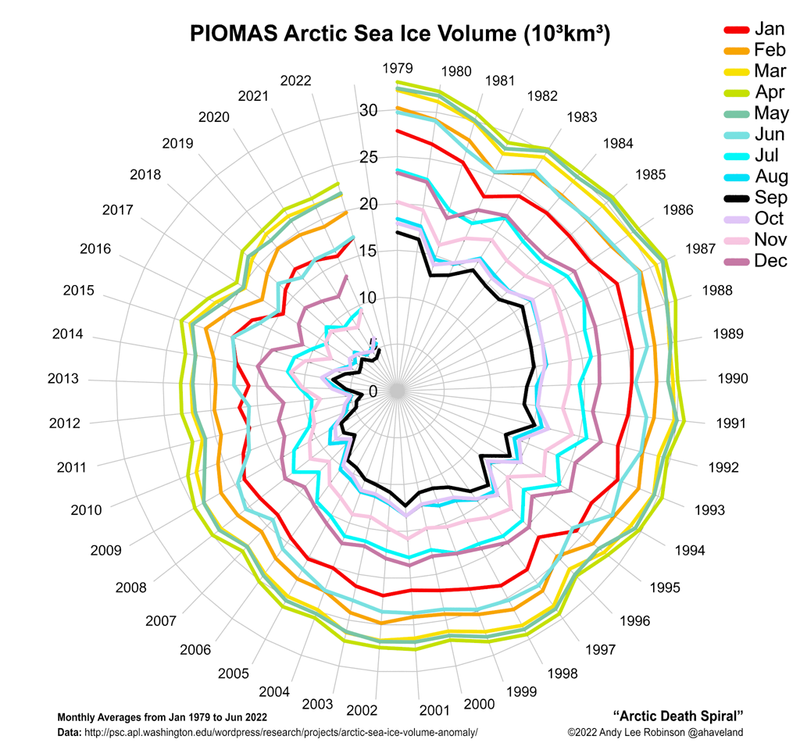 Another way of depicting the continued fall of the sea ice volume is the Arctic Death Spiral below, by Andy Lee Robinson. This puts the sea ice in a very weak position. This month, the sea ice will reach its highest volume, which may well be the lowest volume on record for April. The Naval Reserach Laboratory 30-day animation below shows recent sea ice thickness. The lowest sea ice volume for 2014 is expected to be reached in September, and - given the shape the ice is in now - will likely be one of the lowest minima on record. In fact, there is a chance that there will be no ice left whatsoever later this year. 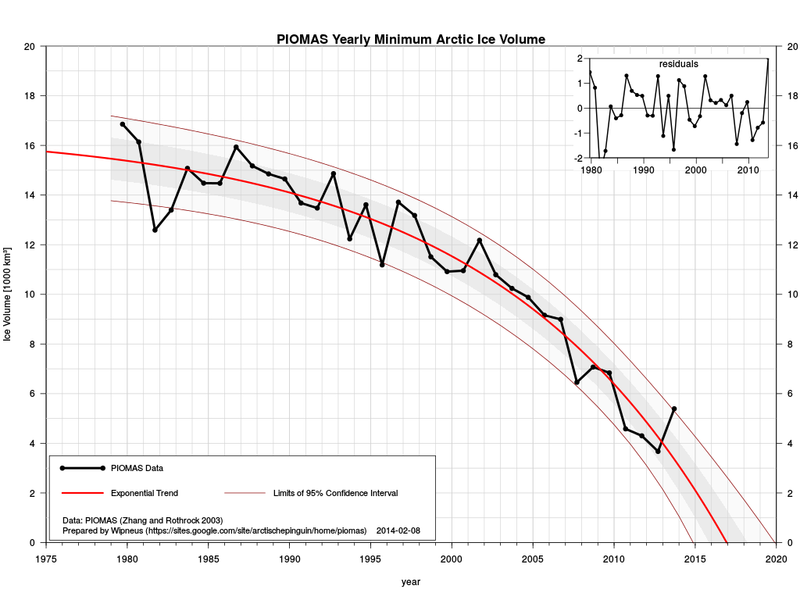 As illustrated by the image below, again by Wipneus, an exponential curve based on annual minima from 1979 points at zero ice volume end 2016, with the lower limit of the 95% confidence interval pointing at zero ice end of 2014. 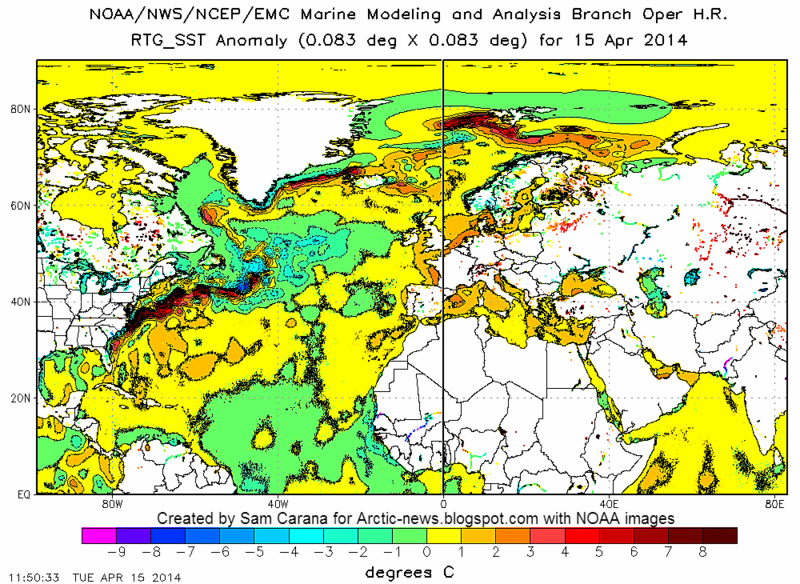 Absence of sea ice will mean that a lot of more heat will be absorbed by the Arctic Ocean. As NSIDC.org describes, sea ice reflects 50% to 70% of the incoming energy, but thick sea ice covered with snow reflects as much as 90% of the incoming solar radiation. After the snow begins to melt, and because shallow melt ponds have an albedo of approximately 0.2 to 0.4, the surface albedo drops to about 0.75. As melt ponds grow and deepen, the surface albedo can drop to 0.15. The ocean reflects only 6% of the incoming solar radiation and absorbs the rest. Furthermore, all the heat that during the melt went into transforming ice into water will - in the absence of ice - be absorbed by the ocean as well. Such feedbacks are causing warming to accelerate in the Arctic Ocean, much of which is very shallow and thus vulnerable to warming. The Gulf Stream can be expected to keep carrying warmer water into the Arctic Ocean. Extreme weather events such as heatwaves and cyclones could make the situation a lot worse. 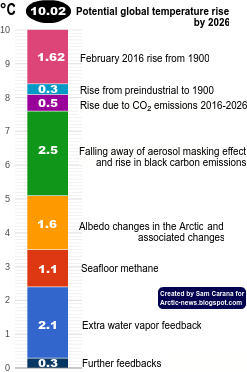 Warming of the Arctic Ocean threatens to destabilize huge amounts of methane held in sediments at the seafloor, in the form of free gas and hydrates. The danger is that release of methane from the seafloor of the Arctic Ocean will warm up the Arctic even further, triggering even more methane releases, as well as heatwaves, wildfires and further feedbacks, in a spiral of runaway warming that will lead to starvation, destruction and extintion at massive scale across the globe. A team of researchers lead by Florida State University have found new evidence that permafrost thawing is releasing large quantities of greenhouse gases into the atmosphere via plants, which could accelerate warming trends. The research is featured in the newest edition of the Proceedings of the National Academy of Sciences. Permafrost is soil that is frozen year round and is typically located in polar regions. As the world has gotten slightly warmer, that permafrost is thawing and decomposing, which is producing increased amounts of methane. Relative to carbon dioxide, methane has a disproportionately large global warming potential. Methane is 33 times more effective at warming the Earth on a mass basis and a century time scale relative to carbon dioxide. As the plants break down, they are releasing carbon into the atmosphere. And if the permafrost melts entirely, there would be five times the amount of carbon in the atmosphere than there is now, said Jeff Chanton, the John Widmer Winchester Professor of Oceanography at Florida State. “The world is getting warmer, and the additional release of gas would only add to our problems,” he said. Chanton and Hodgkins’ work, “Changes in peat chemistry associated with permafrost thaw increase greenhouse gas production,” was funded by a three-year, $400,000 Department of Energy grant. They traveled to Sweden multiple times to collect soil samples for the study. The research is a multicontinent effort with researchers from North America, Europe and Australia all contributing to the work. 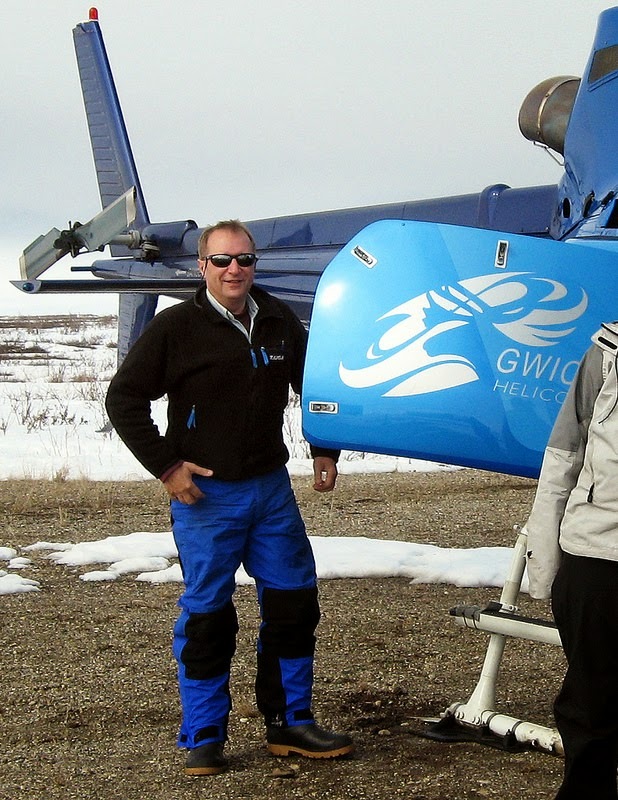 A new study led by Lance Lesack, a Simon Fraser University geographer and Faculty of Environment professor, has discovered unexpected climate-driven changes in the mighty Mackenzie River’s ice breakup. This discovery may help resolve the complex puzzle underlying why Arctic ice is disappearing more rapidly than expected. Lesack is the lead author on Local spring warming drives earlier river-ice breakup in a large Arctic delta. Published recently in Geophysical Research Letters, the study has co-authors at Wilfrid Laurier University, the University of Alberta and Memorial University. Its goal was to understand how warming global temperatures and the intensifying Arctic hydrological cycle associated with them may be driving increasing water discharges and more rapid ice breakup in the Arctic’s great rivers. 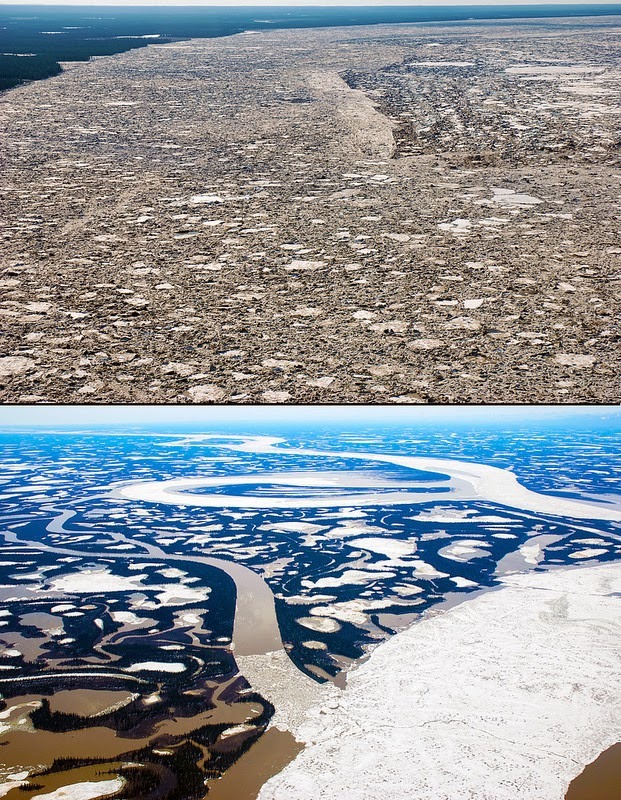 But the researchers stumbled upon an unexpected phenomenon while trying to figure out why the Mackenzie River’s annual ice breakup has been shortening even though its water discharge isn’t increasing, as in Russian rivers. Just slightly warmer springs with unexpected snowfall declines — rather than warmer winters or increasing river discharge, as previously suspected — can drive earlier-than-expected ice breakup in great Arctic rivers. The Mackenzie exemplifies this unexpected phenomenon. The researchers discovered this by accessing records dating back to 1958 of the river’s water levels, snow depths, air temperatures and times of ice breakup. This finding is significant, as Arctic snow and ice systems are important climate-system components that affect the Earth’s ability to reflect solar radiation. channel. Photos by Simon Fraser University. “Our surprising finding was that spring temperatures, the period when river-ice melt occurs, had warmed by only 3.2 degrees Celsius. Yet this small change was responsible for more than 80 per cent of the variation in the earlier ice breakups, whereas winter temperatures had warmed by 5.3 degrees but explained little of this variation,” says Lesack. Lesack says this is the first field-based study to uncover an important effect of reduced winter snowfall and warmer springs in the Arctic — earlier-than-expected, climate-change-related ice breakup. Lesack hopes this study’s findings motivate Canadian government agencies to reconsider their moves towards reducing or eliminating ground-based monitoring programs that measure important environmental variables. There are few long-term, ground-based snow depth records from the Arctic. This study’s findings were based on such records at Inuvik dating back to 1958. They significantly pre-dated remote sensing records that extend back only to 1980. Without this longer view into the past, this study’s co-authors would still be in the dark about the more rapid than expected Arctic melt and planetary heat-up happening. Recent research results show that an atmospheric hole over the tropical West Pacific is reinforcing ozone depletion in the polar regions and could have a significant influence on the climate of the Earth. Potsdam, 3 April 2014. 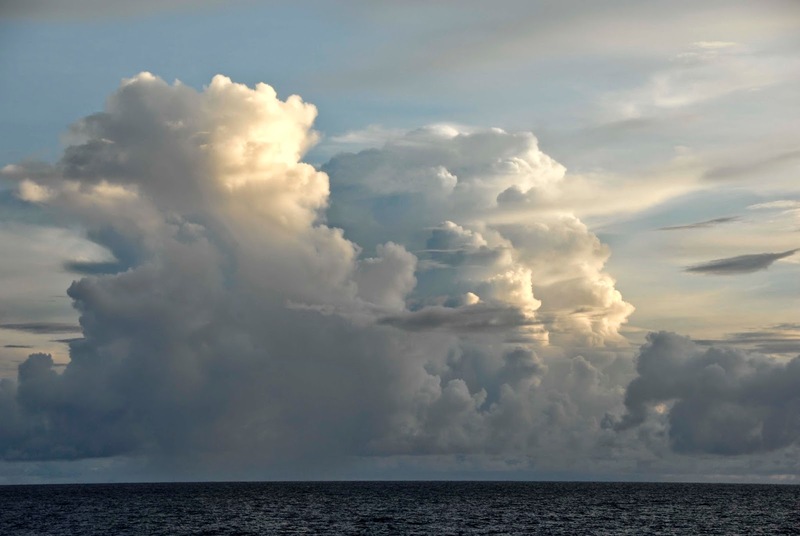 An international team of researchers headed by Potsdam scientist Dr. Markus Rex from the Alfred Wegener Institute has discovered a previously unknown atmospheric phenomenon over the South Seas. Over the tropical West Pacific there is a natural, invisible hole extending over several thousand kilometres in a layer that prevents transport of most of the natural and manmade substances into the stratosphere by virtue of its chemical composition. Like in a giant elevator, many chemical compounds emitted at the ground pass thus unfiltered through this so-called “detergent layer” of the atmosphere. Scientists call it the “OH shield”. The newly discovered phenomenon over the South Seas boosts ozone depletion in the polar regions and could have a significant influence on the future climate of the Earth – also because of rising air pollution in South East Asia. West Pacific, the cleaning capacity of the atmosphere is reduced. At first Dr. Markus Rex suspected a series of flawed measurements. In October 2009 the atmospheric physicist from the Alfred Wegener Institute, Helmholtz Centre for Polar and Marine Research (AWI) was on board the German research vessel “Sonne” to measure trace substances in the atmosphere in the tropical West Pacific. Tried and tested a thousand times over, the ozone probes he sent up into the tropical sky with a research balloon every 400 kilometres reported – nothing. Or to be more accurate: almost nothing. The ozone concentrations in his measurements remained nearly constantly below the detection limit of approx. 10 ppbv* in the entire vertical range from the surface of the Earth to an altitude of around 15 kilometres. Normally ozone concentrations in this part of the atmosphere are three to ten times higher. Although low values at an altitude of around 15 kilometres were known from earlier measurements in the peripheral area of the tropical West Pacific, the complete absence of ozone at all heights was surprising. However, after a short period of doubt and various tests of the instruments it dawned on the worldwide recognised ozone specialist that he might be onto a phenomenon yet unknown to science. A few research years later and after the involvement of other colleagues came confirmation: Markus Rex and his team on board the “Sonne” had tracked down a giant natural hole over the tropical South Seas, situated in a special layer of the lower atmosphere known as the “OH shield”. 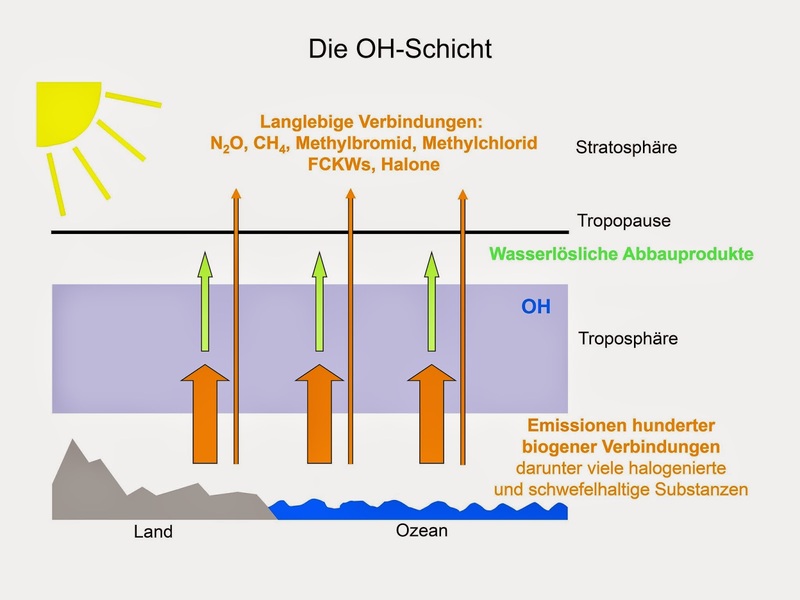 The research results on the newly discovered OH minimum will be published soon in the journal “Atmospheric Chemistry and Physics”, with the Institute of Environmental Physics of the University of Bremen and other international research institutions as partners. molecules remove most substances from the atmosphere. rise through the OH shield into the stratosphere. “Even though the sky appears to be an extensively uniform space for most people, it is composed of chemically and physically very different layers,” Markus Rex explains the complex makeup of the atmosphere. The air layers near the ground contain hundreds or even thousands of chemical compounds. This is why winter and spring, mountains and sea, city and forests all have a distinct smell. The great majority of these substances are broken down into water-soluble compounds in the lower kilometres of the atmosphere and are subsequently washed out by rain. Since these processes require the presence of a certain chemical substance, the so called hydroxyl (=OH) radical, this part of the atmosphere is called the “OH shield”. It acts like a huge atmospheric washing machine in which OH is the detergent. The OH shield is part of the troposphere, as the lower part of the atmosphere is called. “Only a few, extremely long-lived compounds manage to make their way through the OH shield,” says Rex, “then they also get through the tropopause and enter the stratosphere.” Tropopause refers to the boundary layer between the troposphere and the next atmospheric layer above it, the stratosphere. Particularly substances that enter the stratosphere unfold a global impact. The reason for this is that once they have reached the stratosphere, their degradation products remain up there for many years and spread over the entire globe. Extremely long-lived chemical compounds find their way to the stratosphere, even where the OH shield is intact. These include methane, nitrous oxide (“laughing gas”), halons, methyl bromide and chlorofluorocarbons (CFCs), which are notorious as “ozone killers” because they play a major role in ozone depletion in the polar regions. OH in the tropospheric column of air calculated with a model. Graphics: Markus Rex, Alfred Wegener Institute. After many years of research scientists now understand the complicated process of stratospheric ozone depletion very well. “Nevertheless measured ozone depletion rates were often quite a bit larger than theoretically calculated in our models,” Markus Rex points out a long unsolved problem of atmospheric research. And at the same time discovered a phenomenon that raises a number of new questions for climate policy. Researchers are now tackling these questions in a new research project funded by the EU with around 9 million euros, i.e. 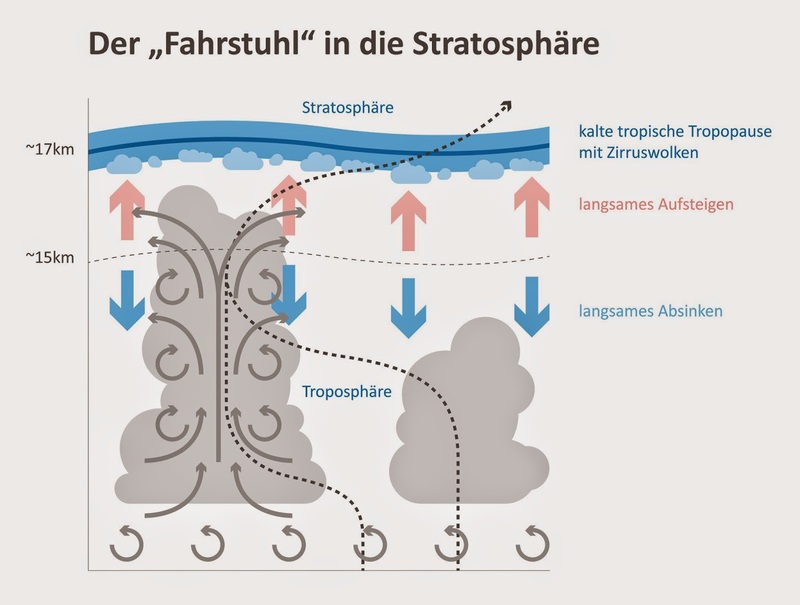 “StratoClim”, which is coordinated by the Alfred Wegener Institute. Within this project a new monitoring station will be established in the tropical Westpacific, together with the Institute of Environmental Physics at the University of Bremen. 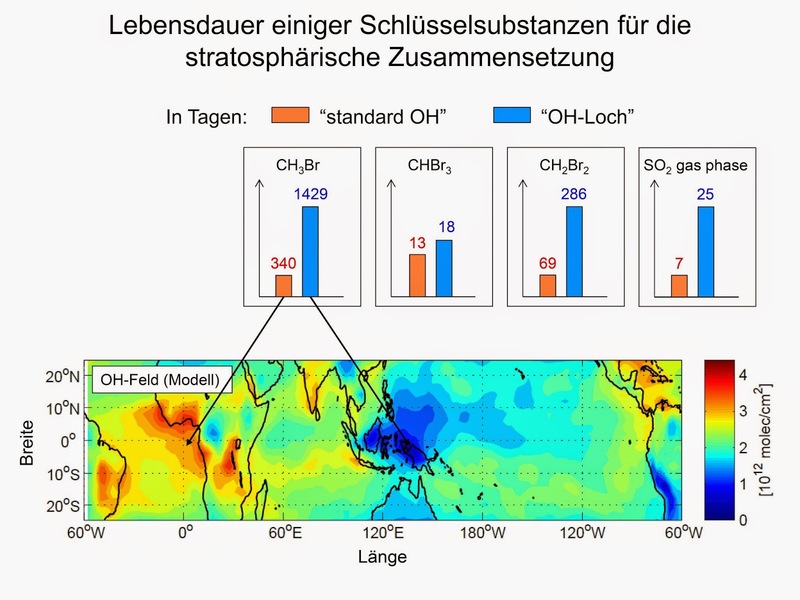 “We have to realise,” reminds the Potsdam atmospheric physicist, “that chemical compounds which enter the stratosphere always have a global impact.” Thanks to the OH hole that the researchers discovered over the tropical Pacific, greater amounts of brominated hydrocarbons can reach the stratosphere than in other parts of the world. Although their ascent takes place over the tropical West Pacific, these compounds amplify ozone depletion in the polar regions. Since scientists identified this phenomenon and took it into account in the modelling of stratospheric ozone depletion, their models have corresponded excellently with the actually measured data. However, it is not only brominated hydrocarbons that enter the stratosphere over the tropical West Pacific. “You can imagine this region as a giant elevator to the stratosphere,” states Markus Rex using an apt comparison. Other substances, too, rise here to a yet unknown extent while they are intercepted to a larger extent in the OH shield elsewhere on the globe. One example is sulphur dioxide, which has a significant impact on the climate. tropopause into the stratosphere over the course of weeks. Graphics: Yves Nowak, Alfred Wegener Institute. 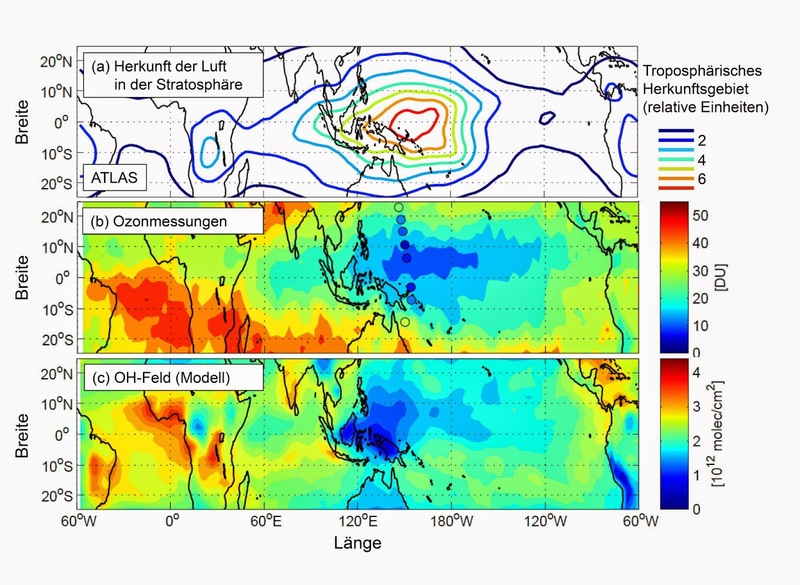 If one takes into account that sulphur dioxide may also reach the stratosphere via the OH hole over the tropical West Pacific, it quickly becomes obvious that the atmospheric elevator over the South Seas not only boosts ozone depletion, but may influence the climate of the entire Earth. In fact, the aerosol layer in the stratosphere, which is also composed of sulphur particles, seems to have become thicker in recent years. Researchers do not know yet whether there is a connection here. Why is there an OH hole over the West Pacific? The air in the tropical West Pacific is extremely clean. Air masses in this area were transported across the expanse of the huge Pacific with the trade winds and for a long time no longer had contact with forests or other land ecosystems that produce innumerable short-lived hydrocarbons and release them into the air. Under these clean air conditions OH is formed from ozone through chemical transformation to a great degree. If there is hardly any ozone in the lower atmosphere (= troposphere), as is the case in the West Pacific, only little OH can be formed. The result is an OH hole. Ozone, in turn, forms in the lower atmosphere only if there are sufficient nitrogen oxides there. Large amounts of nitrogen oxide compounds are produced in particular by intensive lightning over land. However, the air masses in the tropical West Pacific were not exposed to any continental tropical storms for a very long time during their transport across the giant ocean. And the lightning activity in storms over the ocean is relatively small. At the same time the lifetime of atmospheric ozone is short due to the exceptionally warm and moist conditions in the tropical West Pacific. In this South Sea region the surface temperatures of the ocean are higher than anywhere else on our planet, which makes the air not only quite warm, but also quite moist. The ozone is thus quickly lost, especially directly above the water. And due to the lack of nitrogen oxide compounds little ozone is subsequently formed. Rapid vertical mixing in the convection areas that exist everywhere over the warm ocean and in which the warm air rises takes care of the rest. Finally, there is no more ozone in the entire column of air in the troposphere. 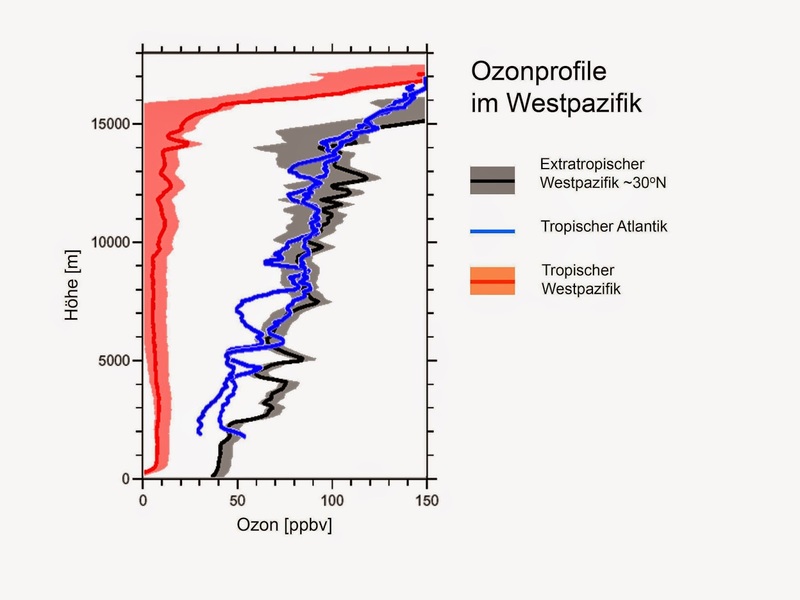 And without ozone (see above) the formation of OH is suppressed. What impact does the OH hole over the West Pacific have? OH-concentrations over the tropical West Pacific. The OH molecule is also called the detergent of the atmosphere. Nearly all of the thousands of different chemical substances produced by people, animals, plants, fungi, algae or microorganisms on the ground or in the oceans react quickly with OH and break down in this process. Therefore, virtually none of these substances rises into the stratosphere. In the area of the OH hole, however, a larger portion of this varied chemical mix can enter the stratosphere. And local emissions may unfold a global impact, especially if they make it to the stratosphere. There they spread globally and can influence the composition of the air for many years – with far-reaching consequences for ozone chemistry, aerosol formation and climate. Why wasn’t the OH hole discovered earlier? The tropical West Pacific is one of the most remote regions on our planet. That is why extensive measurements of the air composition have yet to take place in this area. There is also a considerable gap in the otherwise dense network of global ozone measurement stations here. Even in the past measurements from the peripheral sections of the now investigated region showed minimal ozone values in the area of the upper troposphere, but not the consistently low values that have now been found across the entire depth of the troposphere. The newly discovered phenomenon reveals itself in its full scope only through the measurements that were conducted to such an extensive degree for the first time and was thus not able to be grasped at all previously. *One part of ozone per billion by volume (ppbv) means there is one ozone molecule for every billion air molecules. Extreme weather events are rocketing upwards in their frequency of occurrence, intensity, and duration and are impacting new regions that are unprepared. These events, such as torrential rains, are causing floods and damaging crops and infrastructure like roads, rail, pipelines, and buildings. Cities, states, and entire countries are being battered and inundated resulting in disruption to many peoples lives as well as enormous economic losses. As bad as this is, it is going to get much worse by at least 10 to 20 times. Why? Greenhouse gas emissions from humans have changed the chemistry of the atmosphere. The optical absorption of infrared heat has increased in the atmosphere which raises temperature, and thus water vapor content, and therefore fuels more intense storms. The jet streams that guide these storms are slower and wavier and more fractured and cause our weather gyrations and weird behavior. Areas far north can get very warm, while areas far south can get very cold. Some areas get persistent drought. Then, the pattern can flip. The jet streams are much wavier in the north-south direction since the Arctic temperatures have warmed 5 to 8 times faster than the global average. This reduces the temperature difference between the Arctic and equator and basic physics forces the jets to slow and get wavier. Why is the Arctic warming greatly amplified? The region is darkening and thus absorbing more sunlight, since the land-based snow cover in spring and the Arctic sea ice cover volume are both declining exponentially. The white snow and ice is being replaced by dark surfaces like the ocean and the tundra. The most detailed computer model on sea ice decline is a U.S. Naval Graduate School model, and it shows the sea ice cover could be gone by late summer in 2016. If this happens, the Arctic warming will rocket upwards, the jets will distort much more, and the extreme weather events will rocket upwards in frequency, amplitude, and duration and civilization will be hammered. Paul Beckwith is part-time professor with the laboratory for paleoclimatology and climatology, department of geography, University of Ottawa. Paul teaches climatology/meteorology and does PhD research on 'Abrupt climate change in the past and present'. Paul holds an M.Sc. in laser physics and a B.Eng. in engineering physics and reached the rank of chess master in a previous life. Below are Paul's earlier posts at the Arctic-news blog. indications of imminent catastrophic methane eruptions? The image below shows high methane concentrations over Greenland and over the Arctic Ocean. The large yellow areas on this image indicate that the methane entered the atmosphere there. This is especially likely when such large yellow areas keep appearing in the same area over a few days. In the case of the large yellow areas around Novaya Zemlya, the methane is likely to have travelled there underneath the sea ice, from the Gakkel Ridge, to enter the atmosphere where the sea ice was thin or fractured enough for the methane to pass through, as discussed in earlier posts. As described in the post High methane readings over Greenland, huge temperature swings can hit areas over Greenland over the course of a few days. Temperature anomalies may go down as low as as -20°C one day, then climb as high as 20°C a few days later, to hit temperature anomalies as low as -20°C again some days later. This could explain the methane over Greenland. Methane is present in the Greenland ice sheet in the form of hydrates and free gas. These huge temperature swings are causing the ice to expand and contract, thus causing difference in pressure as well as temperature. The combined shock of wild pressure and temperature swings is causing movement and fractures in the ice, and this enables methane to rise to the surface and enter the atmosphere. To further illustrate this, the image below shows recent temperature anomaly forecasts over Greenland. 2. What is causing these extreme weather events? Frigid cold weather in the U.S., torrential rain and flooding in the U.K., and wild temperature swings over Greenland. What is causing these extreme weather events? 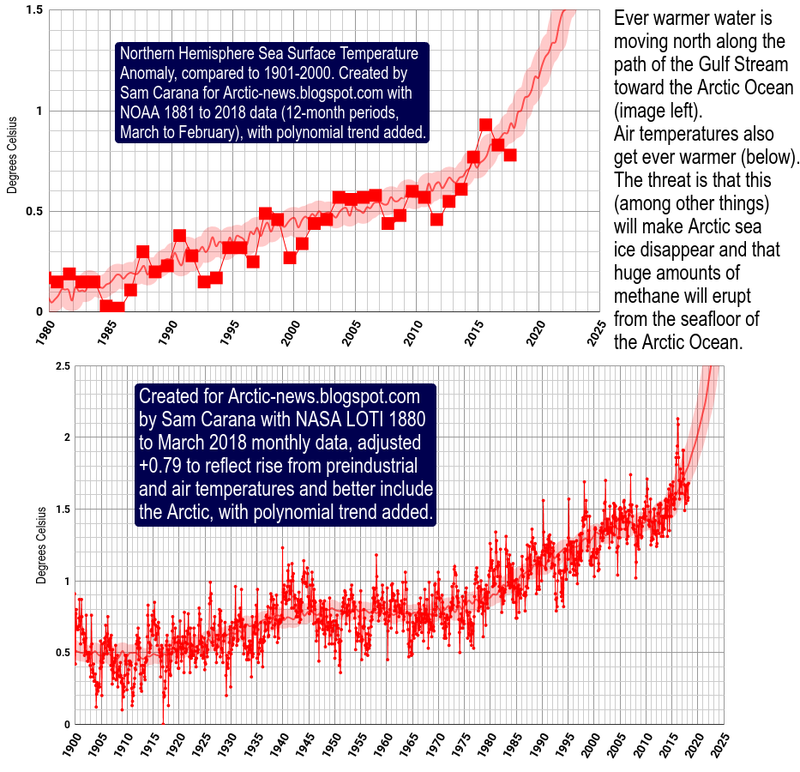 As discussed in many previous posts, the Arctic has become warmer than it used to be and temperatures in the Arctic are rising several times faster than global temperatures. This decreases the temperature difference between the areas to the north and to the south of the Jet Stream, which in turn decreases the speed at which the Jet Stream circumnavigates the globe, making the Jet Stream more wavier and increasing opportunities for cold air to descend from the Arctic and for warm air to enter the Arctic. 3. Did temperature swings also trigger earthquakes? These wild temperature swings may be causing even further damage, on top of the methane eruptions from the heights of Greenland. Look at the above map, showing earthquakes that hit the Arctic in March 2014.
without the Greenland Ice Sheet. 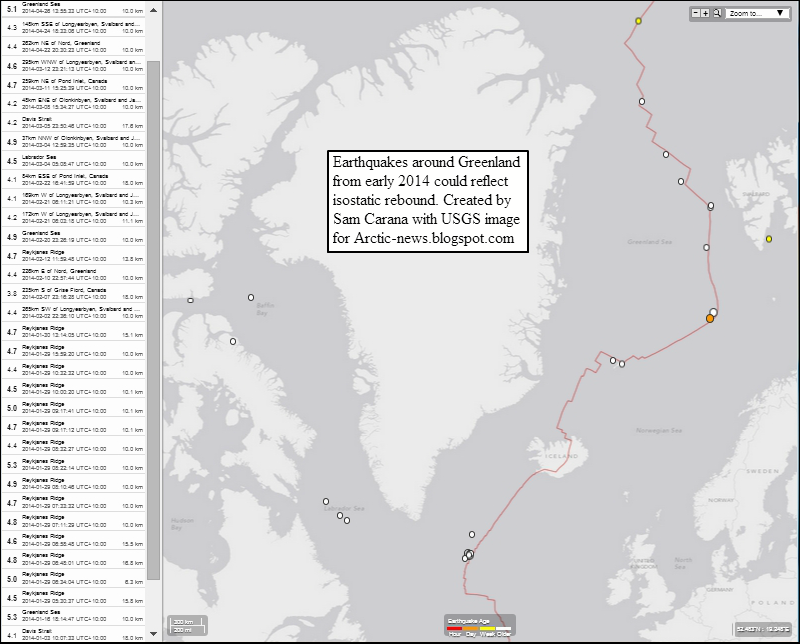 BTW, above map doesn't show all earthquakes that occurred in the Arctic Ocean in March 2014. An earthquake with a magnitude of 4.5 on the Richter scale hit the Gakkel Ridge on March 6, 2014. Importantly, above map shows a number of earthquakes that occurred far away from faultlines, including a M4.6 earthquake that hit Baffin Bay and a M4.5 earthquake that hit the Labrador Sea. These earthquakes are unlikely to have resulted from movement in tectonic plates. 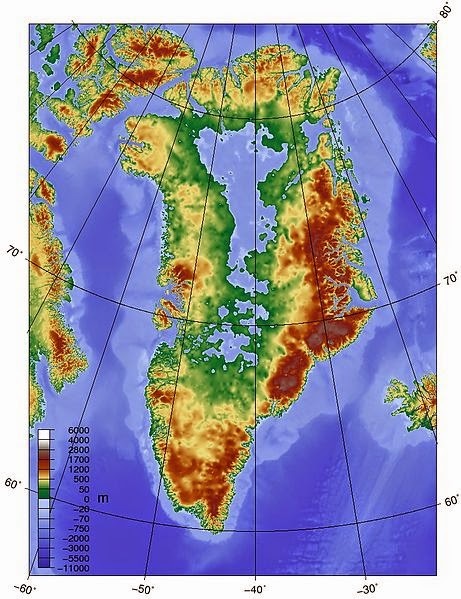 Instead, temperature swings over Greenland may have triggered these events, by causing a succession of compression and expansion swings of the Greenland ice mass, which in turn caused pressure changes that were felt in the crust surrounding the Greenland Ice Sheet. Glaciers could be the key to make this happen. Glaciers typically move smoothly and gradually. It could be, however, that such wide temperature swings are causing glaciers to come to a halt, temporarily, causing pressure to build up over a day or so, to then suddenly start moving again with a shock. Intense cold can literally freeze a glacier in its track, to be shocked into moving again as temperatures rise abruptly by 40°C or so. This can send shockwaves through the ice sheet into the crust and trigger earthquakes in areas prone to destabilization. The same mechanism could explain the high methane concentrations over the heights of Greenland and Antarctica. Ominously, patterns of earthquakes can be indicators of bigger earthquakes yet to come. This situation looks set to get a lot worse. Extreme weather events and wild temperature swings look set to become more likely to occur and hit Greenland with ever greater ferocity. Earthquakes could reverberate around the Arctic Ocean and destabilize methane held in the form of free gas and hydrates in sediments underneath the Arctic Ocean. Meanwhile, as pollution clouds from North America move (due to the Coriolis Effect) over the Atlantic Ocean, the Gulf Stream continues to warm up and carry warmer water into the Arctic Ocean, further increasing the likelihood of methane eruptions from the Arctic seafloor. The above image shows the Gulf Stream off the coast of North America, while the image below shows how the Gulf Stream continues, carrying warmer water through the Atlantic Ocean into the Arctic Ocean. Feedbacks, such as the demise of the Arctic's snow and ice cover, further contribute to speed up the unfolding catastrophe. Methane eruptions from the seafloor of the Arctic Ocean have become especially noticeable over the past half year. The big danger is that this will develop into runaway global warming, as discussed in the recent post Feedbacks in the Arctic. Furthermore, as-yet-unknown feedbacks may start to kick in. As an example, submarine earthquakes and volcanoes could add nutrients into the water that feed methane-producing (methanogenic) microbes. A recent study found that expansion of such microbes could have played a large role in the end-Permian extinction, and that it was catalyzed by increased availability of nickel associated with volcanism. Authors support their hypothesis with an analysis of carbon isotopic changes leading up to the extinction, phylogenetic analysis of methanogenic archaea, and measurements of nickel concentrations in South China sediments.